Since Document One’s first release on Technique Recordings, they’ve formulated a particularly volatile compound of jazz, funk, hip-hop, and tech. And they’ve proven its effectiveness by chalking up enviable levels of radio airplay, DnB chart status, and rave destruction. Now, there’s a brand new five-track EP to deliver another dose. 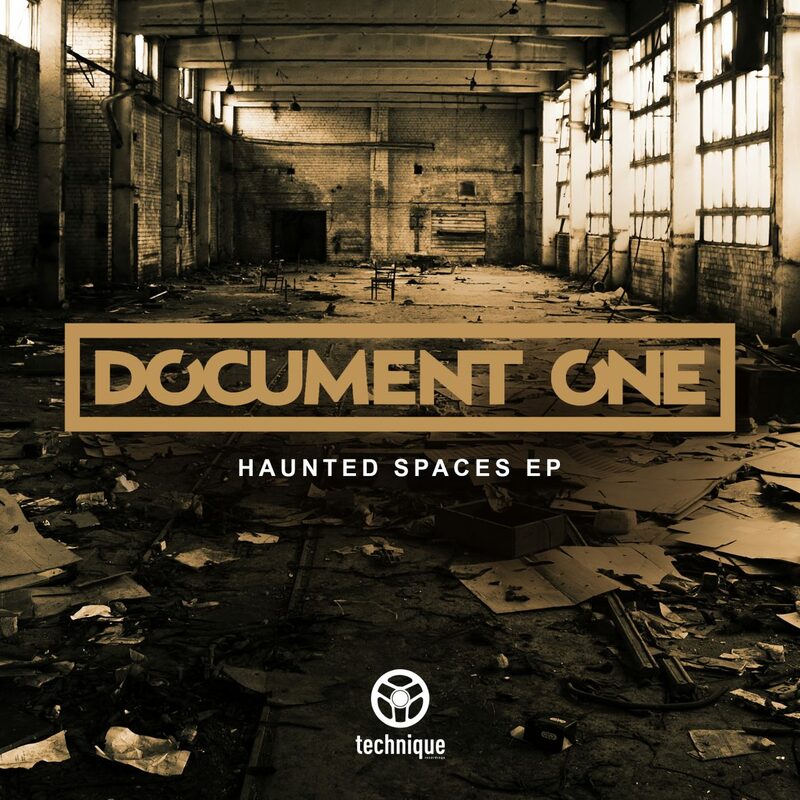 This time, Document One are exploring the darker side of their nature, guiding us into the shadows with the upright-bass-meets-murder-minded-rap of “Haunted Spaces”. The EP’s title track builds through a sparse intro into a rhythmically-twisted drop. The punch and snap of kick and snare are coupled with a driving fusion of natural and synthetic basses. There’s a heartbeat of dancefloor funk, but this is no laid-back, casual groove. It’s a gritty, evil piece of music that sets the template for the rest of the release. As we move through “Pulse” and “Newton”, we’re taken deeper into the neuro side of Document One’s sound. Epic sci-fi landscapes build into claustrophobic cyber-nightmares, populated by gritty basslines and metronomically savage beats. “Pulse” explores the call-and-response structure, giving us an intergalactic frequency-range war. “Newton” does things differently, focusing on laser-guided missile strikes of low-end to drive the track along. Here, these producers prove they can strip away the jazz and go for the pure dark tech flavour without sacrificing any of their dancefloor energy. “Rudeboy Fashion” does something different again. Still, though, there’s no lack of that wide cinematic space, even when the rap vocal motif rolls in. The ultra-clean drums that drop with pitch-bending and modulating basses give this a feeling of classic techsteppers but brought bang up to date. Here, Document One show that they’re capable of exploring multiple sub-genres without losing the essence of their style. To round off the EP, “Clergy” adds yet another twist to the tale. Reverberant pads and effects swirl around a restrained but rolling beat. Basslines morph and modulate in the low registers, while the emcee verse conjures night-shrouded imagery. This is a stripped-back production, with Document One combining just a few perfectly-constructed elements to create the vibe. Very dark, and a tune that discerning dancefloors are going to love. This EP is set to reconfigure our expectations of Document One. It has their production fingerprints all over it, but presented in a different, more midnight-tinged, package. It just goes to show the artistry in their style, and it’s clear these tracks are another milestone in the onwards-and-upwards Doc One progression.